It's been quite some time since I have had the chance to shoot a look with my dad, but the other day we had a few free minutes for a rush shoot out at my favorite location. I'm kind of in love with these free people railroad trousers. I wear them WAY too much, but they are so cute and springy. I've never done a denim on denim look, so I thought it was just about time. I felt like combining modern and vintage all in one -- what better way to do that than to combine foiled hologram heels and suspenders?! Thank you so much, dear! I followed back! I ADORE those pants!!! oh my goodness. Where did you get them??? 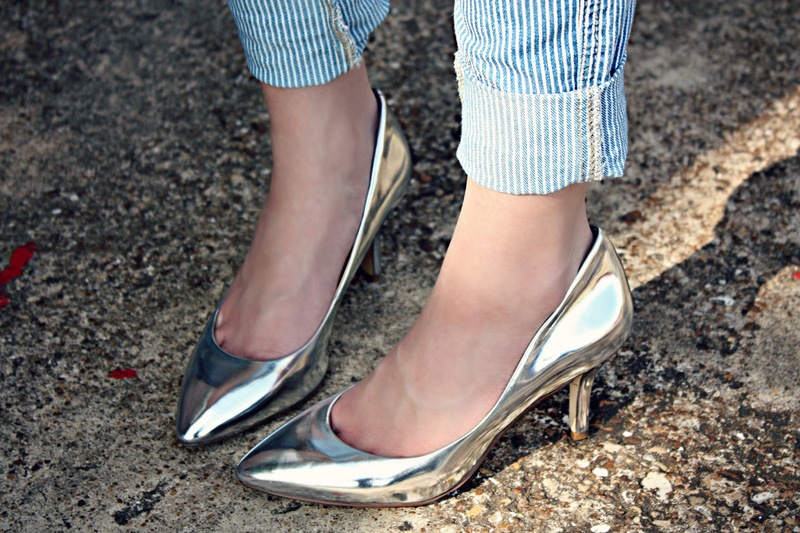 Cute look and I really like the metallic heels. Your dad takes all your photos? IS he a photographer? Those are great pictures. OH! The jeans are so wonderful! They are from free people. I simply love them. hah no, my dad isn't a photographer at all. We just started a hobby of taking pictures together. Quite a few of my photographs are professionally taken by friends of mine who are photographers. aw that is sweet! Thank you!